I had wanted to try Pathfinder for a long time, but never had the opportunity to. 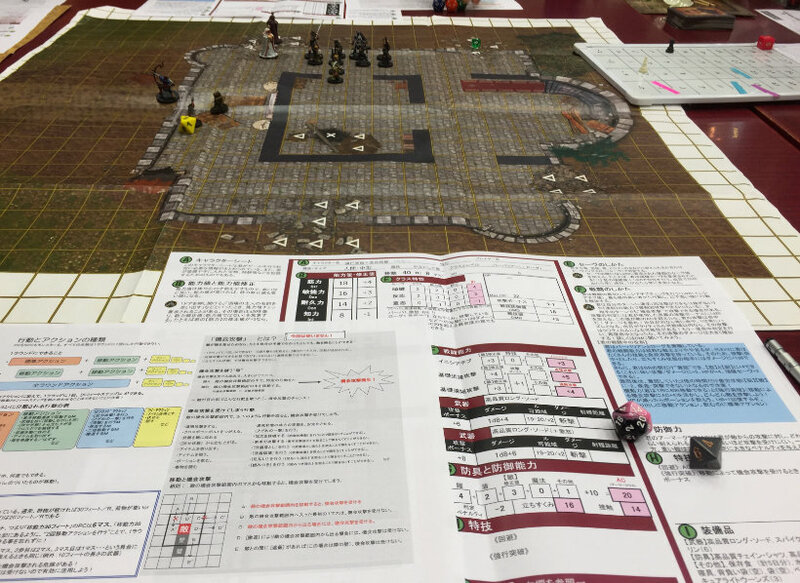 That changed on Saturday when I finally had a chance to play in a Pathfinder game at the Tokyo Dungeons and Dragons Annual Convention. Similar to D&D 5th edition, a localized version of Pathfinder has not actually been officially available in Japan. Instead, players have been using the English version or the fan-translated PRD. ArcLight Games will be releasing Japanese versions of both the Pathfinder RPG and card game later this year. Because the Japanese edition is not out yet, I participated in an arrangement of the English beginner box set with helpful handouts in Japanese. 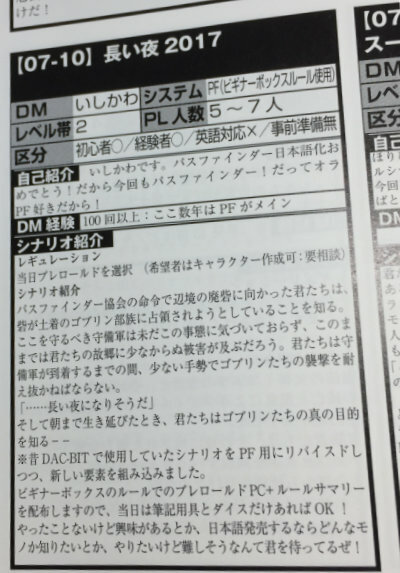 In addition to the beginner box characters, the DM also provided a number of custom pre-rolled characters to choose from. And since first level characters are fairly squishy, we started at second level. I chose a barbarian/rogue multi-classed character and had a thoroughly fun time playing it. The simplified rules reference and annotated character sheet were very handy. Annotated character sheet top left, regular character sheet top right, and rules summary bottom left. I have some experience with D&D 3.0 and 3.5, but I hadn’t played either in a long time. Two of the other players had a little experience with Pathfinder. The DM did a wonderful job of explaining the rules and provided very handy reference sheets to get us started. Since all of the players had experience with some version of D&D, we played with attacks of opportunity rules. Our party consisted of a wizard, fighter, ranger, and my barbarian/rogue, plus a higher level NPC cleric that definitely saved our bacon more than once. I’ll avoid detailing too much of the adventure to avoid spoiling it for others, but the prep work by the DM was awesome, and we all loved the goblin catapults made of spoons! The session was broken down into three sections. The first was an explanation of how to play and tutorial battle. The second was another combat in the same location as the tutorial battle, this time being the defenders. Finally, the third section was delving under the ruins in search of a goblin burial ground. After the game finished, the DM showed us the contents of the starter set as well some of the handy accessories, such as NPC cards, published by Paizo. 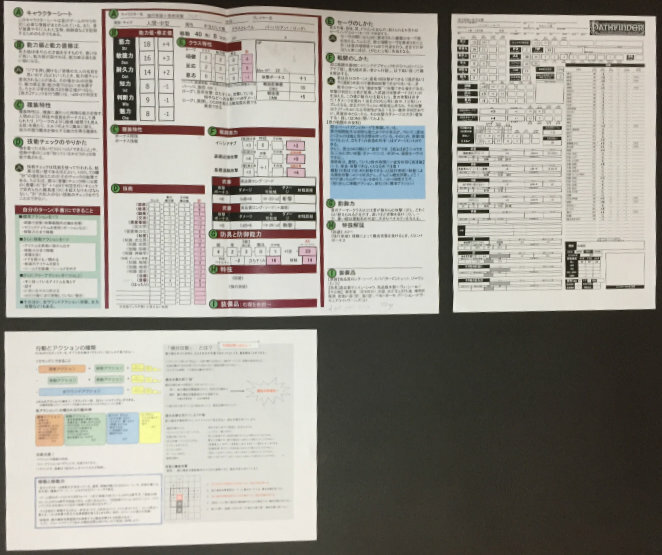 He was also nice enough to provide us with the real character sheets for the characters we played to supplement the simplified versions we used. While I probably won’t switch my regular game from 5e, I did enjoy playing a very well made, crunchy RPG. Given the chance, I’d definitely play more Pathfinder.